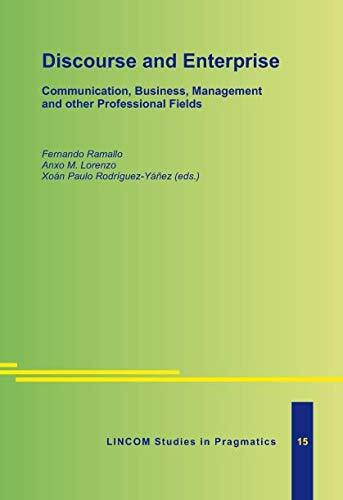 This book is a collection of new approaches to the study of communication in business and other professional fields. The chapters are all related to the role of discourse -spoken and written language- produced in different domains. The contributions offers a multidisciplinary approach to this topic and therefore provides a number of representative perspectives to the different theoretical and methodological traditions that characterise this subject from the experiences of different people in different parts of the world. The variety in the articles gives a broad-based approach to the main objectives of this book, applying several representative theoretical and methodological views on the different traditions in this subject matter. Firstly, our aim was to highlight the variety of discourse genres, i.e., business letters, academic tests, advertising, e-mails and online communication, short reports, office conversations, job interviews, press discourse, press releases, city tour guides, pedagogical texts, customer-server conversation, etc. And secondly, to emphasize the presence of a broad variety of theoretical approaches, i.e., systemic-functional linguistics, critical discourse analysis, corpus linguistics, ethnography, pragmatics, conversation analysis and cognitive linguistics. This book targets the university public and/or specialists in the university arena, and is also of interest to researchers and professionals in the fields of linguistics, communications, marketing, microeconomics, advertising, etc. As far as university courses are concerned, this book is aimed at graduate and postgraduate students, teachers and researchers, for degrees covering communications, linguistics, modern languages, journalism, economics, management, etc.